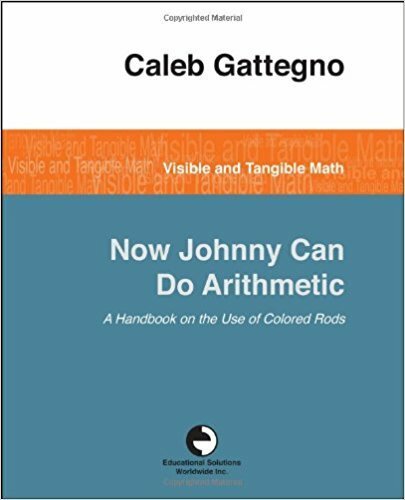 I'm taking a break from my series in Gattegno Textbook 1 to review Caleb Gattegno's book, Now Johnny Can Do Arithmetic which is available free at ISSUU, just click the image. 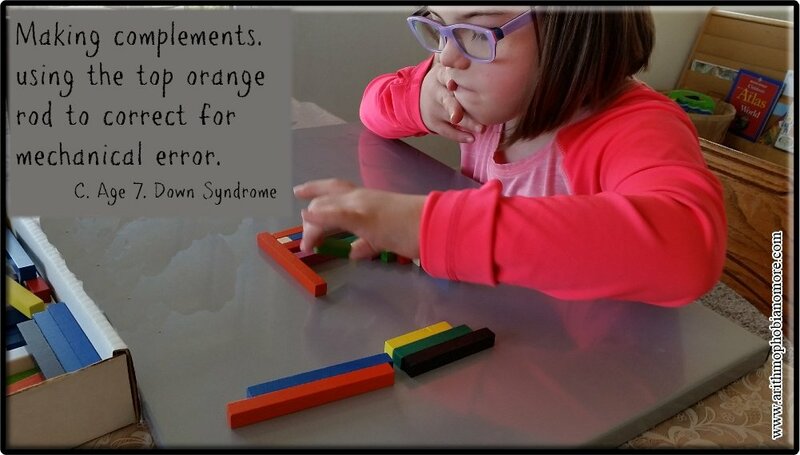 The reason I've taken a break from the Gattegno Textbook is that I have a lot of new readers to my blog, which means they are new to Caleb Gattegno and Cuisenaire Rods. And dropping these folks into the middle of Textbook 1 isn't very nice.​ Even though I love the books, when you start out, you don't know what you are doing. So, let's make the entry point super simple. Now Johnny Can Do Arithmetic was written for parents but was also a favorite among teachers. There are probably many reasons for this including the fact that the book is incredibly accessible to the average person. Here are my reasons for why you should start your Gattegno journey with this book. The exercises are treated as games. Most of the book is treated as a bunch of games to play, not exercises to accomplish. Do not be deceived by the simplicity of the games. Students are internalizing way more than you realize. 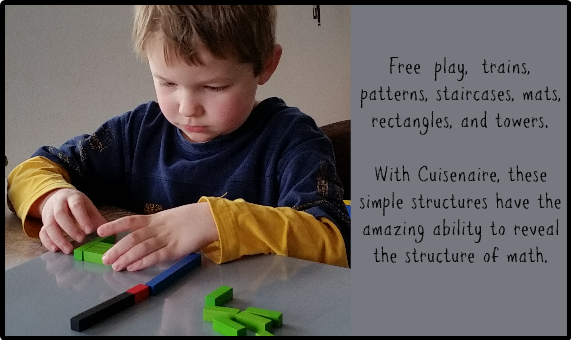 That is one of the joys of Cuisenaire Rods. 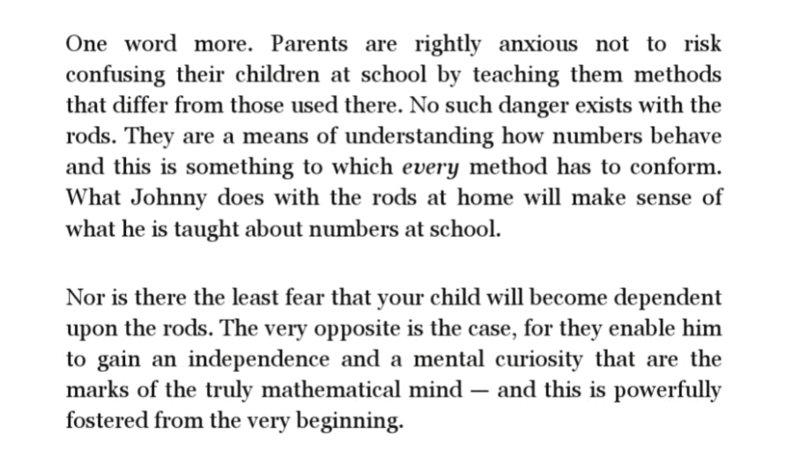 Each new area of mathematics isn't starting from scratch. Division can easily be derived from addition, which means the student doesn't need to know the multiplication tables to understand division. The games help the student read the many "interrelated math processes, all of which are seen as a single mathematical truth." ​It can be used a supplement or a curriculum. ​The book was written for parents whose children were attending school as a way to help them help their children. It isn't a full curriculum but will introduce a child to all the Cuisenaire Rod structures used in the textbooks in a casual, non-threatening way. You can test drive the method before committing to radically changing your math program. The language is accessible to normal parents. Unfortunately, Caleb Gattegno has a way of philosophizing that most of us aren't used to. For some people, a lot of people, he can be intimidating. Now Johnny Can Do Arithmetic is written with parents in mind. It is easily accessible and understandable by everyone. And it's short; a mere 122 pages of larger type. Lots of white space, so it's easy on the eyes. The explanations for the exercises are more casual and connect the parent to the big picture. I'm a big picture kind of girl. I want to see the big picture and then how all the pieces fit together. Just because it is short, and just because it's mostly games, doesn't mean there isn't a lot packed into this book. Let's look at what's covered: pre-number games for the 2 to 5 year old crowd, patterns, addition, subtraction, short division, multiplication, fractions, proportion, length, area, volume, highest common factor, least common multiple, numbers in a series, exponents, intersecting series, and some fun stuff with adding and subtracting large numbers. 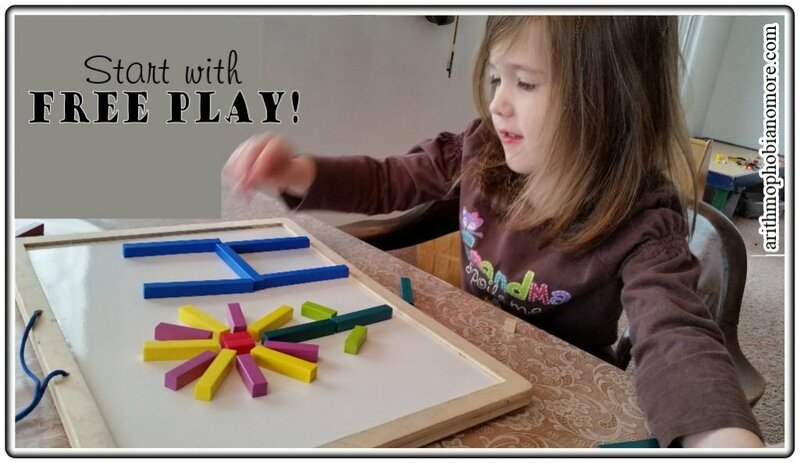 In addition to this, Gattegno provides the parent with games to play that will build the necessary skills to deal with the widest range of mathematical problems the student is likely to encounter in a standard textbook in the elementary grades. That means it is one book for all of elementary. It is not a new thing but adds meaning to what you're already doing. There are reasons to read this book even if you've been using the curriculum and started with C.E. Chambers book on Cuisenaire Rods and the Gattegno Textbooks. In Now Johnny Can Do Arithmetic, Gattegno walks you through a few of the obstacles conventional methods place before the student. If you are an astute parent/teacher, you will follow his pattern and consider additional obstacles you have placed in front of your scholar. My list is fairly long: interrupting my student's thinking with questioning and talking, giving hints and answers instead of letting him think, change the rules mid-stream, moved too fast and assumed he mastered material when he hadn't, ignored the importance of learning the language of mathematics and was content with competent calculations and following procedures. I could go on but you get the point. ​One thing you'll notice if using the Gattegno Textbooks, is that there is no indication of when to move ahead. The exercises are presented a very straight-forward manner. What you get from Now Johnny Can Do Arithmetic is the very casual and conversational tone. Gattegno offers reassurance and he does give the clues about when to move a child through the learning stages. In this book, he provides context for the exercises and provides some of the why behind it. He doesn't give it all to you; that would miss the point. You're also going to find more observation and noticing in this book than in the textbooks. ​Every child should be given the opportunity reason and make sense of the material in front of them. Making logical conclusions about the world around you based on the information you have is part of what makes us human. Gattegno's premise that to live is to engage in algebraic thinking means that nearly everyone can do math to a fairly high level. And you and your children are no exception. If you would like to purchase a copy of Now Johnny Can Do Arithmetic you can find it on A﻿﻿mazon, Cuisenaire Company UK, and Educational Solutions.​ Now sure why, but it's very expensive to purchase from Amazon. Before you purchase from Educational Solutions, make sure you check out the math sets, the books are often on sale for $59 for 7 books. That is the entire curriculum for all of elementary and a good portion of a first year algebra course.